needs. Open everyday weather permitting. 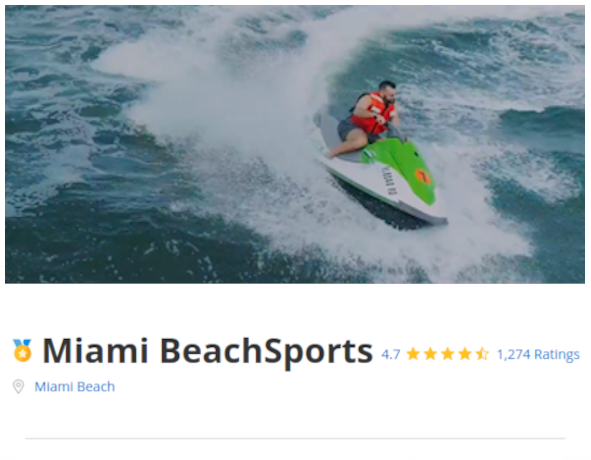 Welcome to Miami-beachsports, waverunner and jet ski rentals. We have 26 years of experience and take pride in our safety record. You will now experience the best staff in Miami Beach with top of the line Yamaha Waverunners. With our close proximity to the Fontainebleau Hotel, SOHO Hotel, and Eden Roc Resort, we are at your doorstep and conveniently located off of the oceanfront board-walk. We accept cash, Visa, Mastercard, and American Express. Open daily weather permitting - Please call (786) 412-1481 first... ***Take Note: Groupon Certificates bought are Valid for 1 Year from Date Puchased NOT 6 Months. Come Early BUT Always call first as Weather may be a factor! © Copyright 2018 MIAMI BEACHSPORTS. Anyone born on or after January 1, 1988 who operates a vessel powered by 10 horsepower or more must pass an approved boater safety course and have in his/her possession photographic identification and a boating safety education identification card issued by the FWC or temporary certificate issued by an authorized vendor. Cost: $3 - THIS IS DONE ON SITE AND IS FAIRLY SIMPLE - QUESTIONS? CALL 786-412-1481. Test good for 1 year in Florida. Others under 18 may ride with adults. Click to take FL temporary boaters test. Hand in to staff when you arrive.